The 510 series of feeders/collators are based on a standard 10 station, high capacity bin tower structure with centre registration. Four different models are available in the range, the C 510 Collator, the CF 510 Feeder/Collator, the AC 510 Collator with air separation and the ACF 510 Feeder/Collator with air separation. The units equipped with feeder mode are ideally suited to customers who have a range of digital and litho printed work, some of which may need collated and some which may come pre-collated from a digital engine. There may also be a need to feed digitally printed work from black and white devices, combining coloured pages or covers. The 510 series can feed up to 4000 sets in collator mode, or up to 7000 sheets per hour in feeder mode, offering maximum flexibility for a wide range of work. The machine is controlled from a large LCD display with easy to understand menus. Depending on which of the 510 models you have, start by choosing feeder or collator mode, select type of finishing, set air flow if applicable, hit the proof button and you are ready to go. Save frequent jobs in the memory and check statistics about jobs previously run. Unlike all other friction feed systems on the market, Morgana’s new 510 AC/ACF models offer a unique air separation system. Each bin has fans blowing air into the stack from two sides that radically improves the feeding of statically charged or normally hard to feed stock. 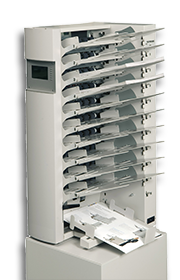 The air separation in the 510 Series sets new standard in feeding, ideal for digitally printed media.